We visit various houses of worship to gain a deeper understanding of one another's traditions and worship. 2018 Bus Tour proposed events: Metro-East Interfaith Partnership is excited to announce our efforts to reach several venues this year. Stay tuned for further details! November 11 - This event was cancelled due to the events with Tree of Life Synagogue. We hope to reprise this event in 2019. Stay Tuned! See our main web page and Facebook page for more details. 2 - 5 p.m. - Sacred Symbols and Scriptures Bus Tour - we are reprising our popular 2006 Bus Tour to the Belleville Masjid & Islamic Education Center, Agudas Achim/Beth Israel, and The Church of Jesus Christ of Latter Day Saints.- O'Fallon Illinois Stake (Latter-Day Saints). Postponed to 2019 – Hindu Temple Tour – proposed 1 p.m. meet to travel and end by 5:00 - 5:30 p.m. Meet at Cross Street Community of Christ Church. Sunday, November 2, bus tour to Holocaust Museum in St. Louis, cost $15, meet at Our Lady of the Snows Shrine to board bus at 1:00. Will return by 5:00. On October 14, 2012 we visited the Hindu Temple in St. Louis (http://www.hindutemplestlouis.org/Temple/VisitUs.aspx) by spending a Sunday afternoon exploring the faith and practices of Hinduism. The fifth Interfaith Bus tour examined the topic, “What Do Our Scriptures Say about Peace?” The bus tour began at the Masjid Islamic Center, with additional visits to St. Clair Catholic Church and Agudas Achim/Beth Israel Synagogue. In 2008 we explored the theme "Sacred Writings" with the Community of Christ, Islam, and Bahá'í traditions. In October 2007, we asked the question “Who’s in Charge?” as we examined how three religions structure life in their faith communities. Topics included: leadership roles, financial management, structure, affiliation with other groups, decision-making process, hierarchy, and how leaders are chosen. We visited: Jewish at Agudas Achim/Beth Israel in Belleville, Muslim at Masjid Islamic Center in Swansea, and Religious Science at Radiance Center for Spiritual Living in Belleville. The 2006 interfaith bus tour on Sunday, October 29, filled two buses and had a caravan of several cars, involving over 100 hundred people. The trip explored Sacred Symbols, providing an opportunity to see and hear the stories behind objects used in worship. Stops included the Masjid Islamic Center, Agudas Achim/Beth Israel, and The Church of Jesus Christ of Latter Day Saints. 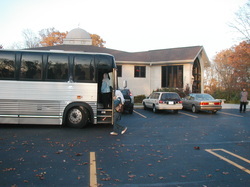 On November 6, 2005, sixty people went on our first interfaith bus tour to celebrate the confluence of fall holidays within three faith traditions. Learn more about the Sacred Seasons in October.